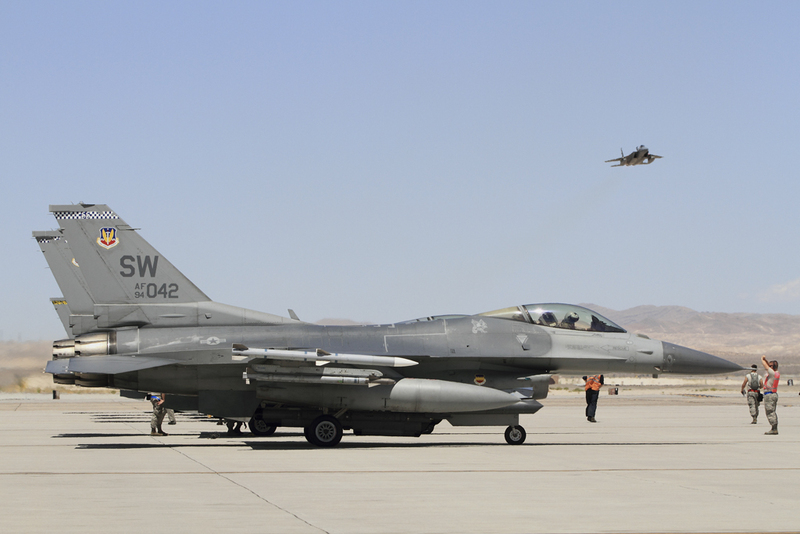 The 414th Combat Training Squadron at Nellis Air Force Base hosted Red Flag 15-3 which took place from July 13th through July 31st 2015. This Red Flag, unlike the others scheduled this year was comprised of only U.S. units. 17 units which included over 115 aircraft took part in the exercises. Media was invited to observe part of the Red Flag exercises on July 21st. In a typical Red Flag exercise, dozens of aircraft take off and are airborne for up to 5 hours at a time flying realistic sorties over the desert in the Nevada test and training ranges. Red, or “hostile” forces attack Blue, or “friendly” forces in realistic combat scenarios. Red forces are comprised of the 57th Adversary Tactics Group, 64th Aggressor Squadron flying F-16s and F15s in the aggressor role sometimes augmented by other U.S. Air Force, Navy or Marine units. Blue forces are usually comprised of units from U.S., NATO and other allied nations. For this exercise all of the Blue force participants were from U.S. Air Force, Navy and Marine units based in the U.S. and Germany. The “Bayou Militia” brought F15Cs from the 159th Fighter Wing, 112nd Fighter Squadron based at NASJRB New Orleans Louisiana. They were joined by F15Es from the 366th Fighter Wing, 389th Fighter Squadron and 391st Squadron from Mountain Home AFB Idaho. Besides the darker paint scheme on the F15Es, a distinctly noticeable difference between the F15Cs and F15Es is the Sniper pods hung under the left air intake. Along with their navigation pods under the right air intake, Sniper pods allow the F15E to fly fast at low altitudes and strike deep into enemy territory. They can detect, identify and engage multiple moving and stationary targets air-to-air or air-to-ground. Sniper pods replaced the LANTIRN targeting pods giving the Strike Eagle 3 – 5 times more range and can even allow the pilots to isolate individual enemy soldiers on the ground beyond jet noise range. Sniper pods have a two-way video datalink to communicate with forward deployed forces. F16CMs from the 52nd Fighter Wing, 480th fighter squadron based at Spangdahlem Air Base in Germany trained along with other F16CMs from the 20th Fighter Wing, 55th Fighter Squadron from Shaw AFB South Carolina. The 52nd Fighter wing F16s which can be distinguished by their darker and usually “dirtier” looking paint scheme employ “Have Glass”, a special coating that contains RAM (Radar Absorbent Material). This reduces the radar cross section of the aircraft giving it a better chance of survival in combat situations. The main role of the 52nd Fighter Wing is for suppression of enemy air defenses (SEAD). The F4G “Wild Weasels” also based at Spangdahlem previously filled the role of air defense suppression missions until they were replaced by F16s and the last F4G left Spangdahlem in late 1987. Tyndall AFB sent the only F22As participating with the Blue forces from the 325th Fighter Wing, 95th Fighter Squadron based near Panama City Florida. The F22A is America’s premier 5th generation air-superiority fighter. It is the only fighter with the ability to simultaneously conduct air-to-air and air-to-ground combat missions without equal. It also fills the role of a reconnaissance, electronic attack and surveillance platform. Fighter/Attack aircraft from the Marines fought alongside the Air Force fighters with their F/A18A++s from VMFA 115 “Silver Eagles” based at MCAS Beaufort in South Carolina. Their mission is to intercept and destroy enemy aircraft and to attack and destroy ground targets. Bomber participation for this Red Flag was from B52Hs of the 5th Bomber Wing, 69th Bomber Squadron out of Minot AFB North Dakota. Airborne command and control was handled by units from the 116th Air Control Wing, 16th ACC squadron flying the E8 from Robins AFB Georgia along with the E3A from the 552nd Air Combat Wing, 960th AAC Squadron. RC135V/W reconnaissance aircraft from the 55th Wing, 38th Reconnaissance Squadron Offutt AFB also participated. Electronic Warfare participants included EC130Hs from the 55th Wing, 43rd Electronic Combat Squadron from Davis Monthan AFB AZ along with Marine EA6B’s from the 2nd Marine Aircraft Wing, Marine Tactical Electronic Warfare Squadron 2 out of MCAS Cherry Point North Carolina and Navy EA18G “Growlers” from Electronic Attack Squadron 138 from NAS Whidbey Island Washington. Aerial Refueling tasks were performed by KC135Rs from the 22nd Air Refueling Wing, 334th Air Refueling Squadron out of McConnell AFB Kansas. The purpose of Red Flag exercises is to give aircrews from different services and/or countries the opportunity to refine their skills and work together in realistic combat situations. This Red Flag saw a vast array of different aircraft platforms working together for the same mission. Weather for Red Flag 15-3 was typical for July in southern Nevada with temperatures in the low to mid 100s and plenty of sunshine. The next scheduled Red Flag will be held August 17th through the 28th 2015. Special thanks to the public affairs office of Nellis Air Force Base.